The Covenant House - Delta Air Lines partnership was established through Covenant House Georgia in 2012. 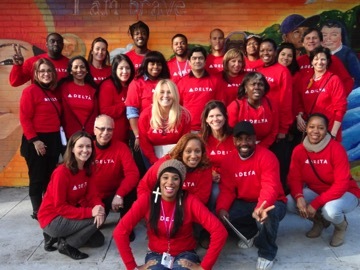 Delta has since expanded both financial and marketing support, as well as mobilized their employees’ involvement with Covenant House in our New York, Los Angeles, Detroit, Newark, and Mexico City locations. In addition to sponsoring and participating in major Covenant House fundraising events such as A Night of Broadway Stars, Sleep Out: Executive Edition, and the Covenant House Golf Classic, Delta has made significant contributions to Covenant House local and international capital campaigns, along with program investment in Detroit, Los Angeles, and Mexico City. Delta has taken their commitment even further by providing internships and jobs for Covenant House youth, arranging for the use of Citi Field and Madison Square Garden for youth/staff softball and basketball games and inviting our youth to major sporting events, an opportunity that most of our kids have never had. As partners, Delta and Covenant House co-promote our partnership to our respective audiences in a variety of ways, and Delta has generously extended in-kind advertising space in the in-flight Delta Sky Magazine. Our growing partnership with Delta Air Lines exemplifies a collaborative spirit that supports Delta’s business and philanthropic goals and Covenant House’s mission to serve homeless and trafficked youth.